These three steps can get you well on your way to helping the environment. - Avoid large containers without a lot inside. - Avoid things that you can't reuse after your done using them the first time. - Buy things that will last you a long time. - Make two-sided copies so your not wasting the back side. - Decrease your junk mail by removing names from mailing lists. - Use cloth napkins and dish towels and wash in cold water. - Save paper and plastic bags, repair things around the house. - Sell things in garage sales or donate them. - Use resealable containers rather then bags and plastic wrap. - Invest in the cloth grocery bags and remember to take them to the store with you. 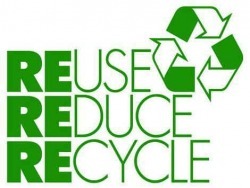 - Buy products that are able to be recycled. - Locate collection centers, or curbside pick ups in your area, like Priority Arrowwaste. - Recycle paper; for example, Zeeland Christian has a PaperGator (only paper no cardboard).